Henry Louis Gates, Jr.: The subject matter of Blinded by Sight is such a fascinating topic, so I have to start with the obvious question: how and why did you get involved in this field of study? Osagie K. Obasogie: Innocently enough, this project started back in 2005 while watching the movie Ray, which portrays the life of the legendary musician Ray Charles. While viewing the movie, I became mesmerized by the central role that race played in Mr. Charles’s life, both in terms of his personal identity and the community that he felt connected to. Since race is largely thought to be a visual experience in the sighted community, I was struck by the way in which Mr. Charles’s lack of vision did not seem to diminish his racial sensibilities. I wanted to learn more about the way race “works” in the blind community. At the time, I assumed that this was a lively conversation across various disciplines, so I began looking at the published literature so that I could learn more about this area of research. Surprisingly, no one had done research on race and blindness. The question simply had not been asked, which speaks to the strength of the assumption that race isn’t all that important to blind people. Given this gap in the literature, I decided to do the research myself. Henry Louis Gates, Jr.: Your research has revealed some of the ways in which blind white people and blind black people first learn how to “see” race conceptually. What were some of the major differences you found in how these two groups experienced race? Osagie K. Obasogie: The differences track rather closely to the different way that race is experienced by sighted whites and blacks. For example, both sighted and blind White respondents tend to see race as something that other people have, i.e. race is something that minorities experience while being White is thought to be “raceless” and remains the default norm. On the other hand, sighted and blind minorities tend to have a much deeper personal connection to issues of race. One thing of interest that came out of the interviews is that several blind White people that I spoke with used their physical disability to analogize to the social disabilities associated with being a racial minority. These respondents would describe experiences in which other people discriminated against them because of their blindness and then assert that these experiences gave them insight into what it is like to be Black or any other minority. It’s interesting how some blind White respondents were able to see connections between their discriminatory experiences and other marginalized groups to create a sense of solidarity in how society can develop stereotypes and treat people unfairly. But it’s also interesting to note that none of the blind respondents of color analogized between race and disability in this manner; they viewed their discriminatory experiences connected to race and disability as being largely distinct. So, this perception that being blind provides insight to what it’s like to be Black may very well be a unique way in which Whiteness plays out in the White blind community. Henry Louis Gates, Jr.: Not only do you address the way blind people view race, but you also discuss the way sighted people view the blind. Specifically, you mention the tendency to believe that blind people live in a “racial utopia” in which ethnic differences are irrelevant. Were there any experiences that you had with blind people, prior to conducting this research, that you had to reevaluate in light of your findings? Osagie K. Obasogie: I did not have any contact with the blind community prior to these interviews and didn’t think much about how blind people experience race until seeing the movie Ray. That being said, at some level I probably assumed, like most people, that blind people had a diminished understanding of race and that it could not be as salient to them as it is to sighted people. This research certainly gave me a new appreciation of the extent to which understanding and “seeing” race has very little to do with vision. That is the gist of the book, i.e. the social and institutional practices that we’re constantly engaged in shape the way we look at people and the way that we live our lives—even for people who are blind. Henry Louis Gates, Jr.: You have made it clear that the goal of your research is to question the idea of political and legal colorblindness, so prevalent since the election of Barack Obama. Why do you think that this notion has become so idealized in our academic discourse and in the media? Is it a distortion based on ignorance and idealism, or is there perhaps a more concrete agenda to it? Osagie K. Obasogie: In the abstract, there is something noble about the idea and metaphor of colorblindness. I think we all wish that we lived in a world where race did not matter when it came to life opportunities and life outcomes. However, I also think we all wish that money could grow on trees and that there is a pot of gold at the end of every rainbow. That, in short, is the problem with colorblindness: it is entirely divorced from reality. It asks us to substitute how we think the world ought to be for how it is, which obscures the day-to-day struggles that racial discrimination places on people’s lives. This leads colorblindness to function as a form of racial subordination itself; turning a blind eye to race is to ignore the experiences of racial minorities, which in effect maintains status quo racial hierarchies. While there is certainly an unfortunate political dynamic behind colorblindness that promotes this ideal to maintain racial inequalities, one thing that I touch upon in my book is the way that metaphors such as “our constitution is colorblind” grease the wheels, so to speak, of these politics by making certain social and political ideas seem more persuasive than they ought to be. An increasing amount of social science and neuroscience research is showing how metaphors play upon the cognitive structure of our brains to allow certain political preferences to seem more palatable. For example, colorblindness is premised upon how we think blind people experience race, i.e. that it is irrelevant to them, that they live in a racial utopia, and that the sighted community can mimic this experience through laws and policies that promote a similar inattention to race. On a surface level, this seems appealing. Some of the sighted people that I spoke with as part of the interviews voiced a certain amount of envy of Blind people, as if they were fortunate to not have to deal with race. But, the interviews offered in my book provides examples of how race affects everyone—even blind people—in a manner that debunks the assumptions that we have about race and blindness. Using blind people’s experiences with race to debunk the intuitions embedded in the colorblind metaphor creates an important space to raise deeper question about the politics of colorblindness. Henry Louis Gates, Jr.: How has this research, along with your critique of the idea of colorblindness, influenced your forthcoming book, Beyond Bioethics: Towards a New Biopolitics. Osagie K. Obasogie: Where Blinded By Sight takes a serious look at race in law and public policy, Beyond Bioethics provides a similar critical insight into the fields of medicine and biomedical research. Like law, medicine often works from a series of presumptions that the differences that we see in health outcomes are a function of nature. For example, health disparities research that attempts to understand why racial minorities are often sicker than Whites often seeks biological or genetic reasons for this difference. And, increasingly, new biomedical innovations premised upon natural differences in racial groups are being offered as solutions to resolving health disparities. One of the issues discussed in Beyond Bioethics is the need to move away from interventions that treat health disparities as natural and that take seriously the social determinants (such as racial inequality) of these disparate outcomes. Beyond Bioethics attempts to get us to think about the political nature of how we understand group difference and remedy group disparities, and encourages greater regulatory oversight to ensure that categories of difference (such as race) are used in medicine in ways that attend to these social and political dynamics. This interview originally appeared on the Oxford African American Studies Center. Osagie K. Obasogie, J.D., Ph.D., is Professor of Law at the University of California, Hastings with a joint appointment at the University of California, San Francisco (UCSF) Department of Social and Behavioral Sciences. He is also a Senior Fellow at the Center for Genetics and Society. Obasogie’s scholarly interests include Constitutional law, bioethics, sociology of law, and reproductive and genetic technologies. His writings have spanned both academic and public audiences, with journal articles in venues such as the Law & Society Review, University of Pennsylvania Journal of Constitutional Law, Stanford Technology Law Review, and the Journal of Law, Medicine, and Ethics along with commentaries in outlets including the New York Times, Slate, the Los Angeles Times, Boston Globe, San Francisco Chronicle, and New Scientist. 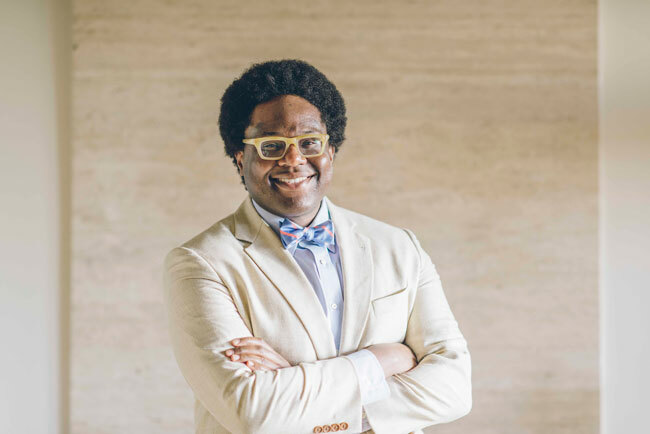 His first book, Blinded By Sight: Seeing Race Through the Eyes of the Blind, was published by Stanford University Press and his second book on the past, present, and future of bioethics is under contract with the University of California Press. Obasogie received his B.A. with distinction from Yale University, his J.D. from Columbia Law School where he was a Harlan Fiske Stone Scholar, and his Ph.D. in Sociology from the University of California, Berkeley where he was a fellow with the National Science Foundation. The Oxford African American Studies Center combines the authority of carefully edited reference works with sophisticated technology to create the most comprehensive collection of scholarship available online to focus on the lives and events which have shaped African American and African history and culture. The Oxford African American Studies Center is free for Black History Month. Simply use Username: blackhistorymonth and Password: onlineaccess to log in. Image courtesy of Osagie K. Obasogie.